Happy Hamby Campers: Winner, winner - chicken dinner! 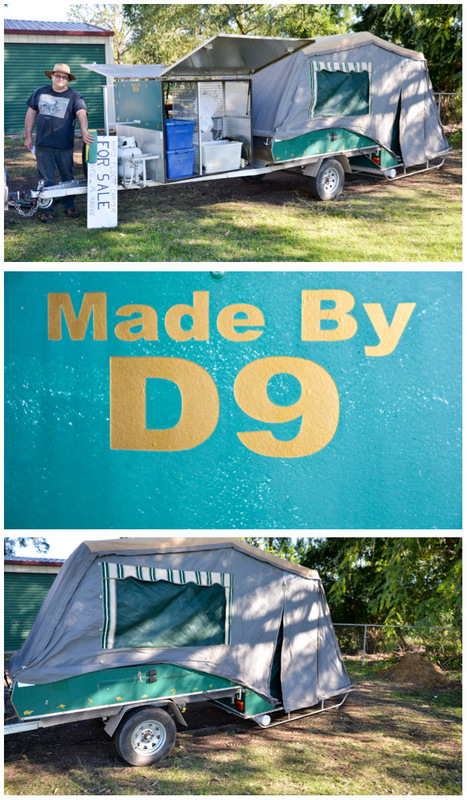 Back in June, Nick and I went to the massive camping/caravaning show in Brisbane. It was a huge day out and we were amazed by all the big-money rigs on offer. 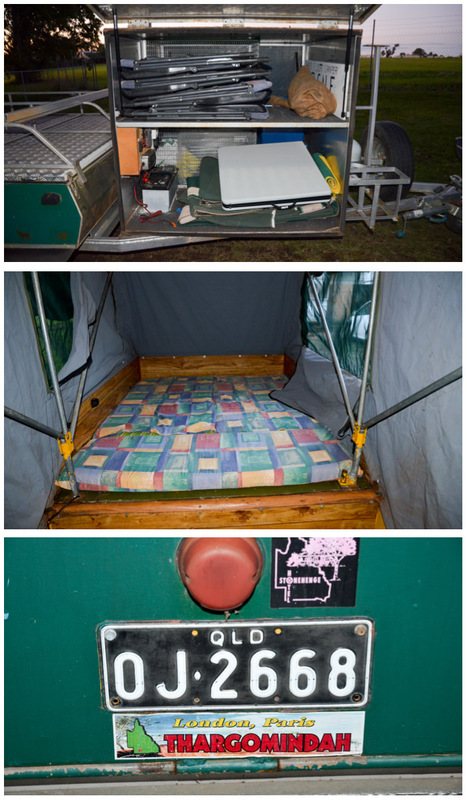 My favourite was a hybrid camper with rather flash bench-height kitchen unit, accessed by a side hatch. It was marvelous! I could see us meal-prepping en route, in fantastic style and I indulged in a (fair) bit of day-dreaming. The reality is the cost of the you-beaut hybrid is around the equivalent of what we consider a house deposit, so we resisted temptation. Our camping gear has undergone various changes over time, to better suit our needs (and experience). While in Victoria we bought a caravan, prompted by the colder climate and a change in Nick's work hours. It ended up being our base for almost 18 months while we readied ourselves for inter-state relocation. As part of those preparations we also sold our trailer, which had served us well for many adventures. We (finally!) relocated to Queensland in February and have enjoyed a few short trips, staying in Bandit-friendly cabins - cos no-one wanted to go back into the van! Nick has extended leave booked for December and January, so we are looking forward to getting away for a longer adventure. Our budget won't stretch to cabin accommodation and we don't consider the van an option. We still have our tents and camping gear. I'd suggested looking for another trailer, possibly with some camping specific modifications, praps even a kitchen. Nick was keen for a multi-purpose box trailer. 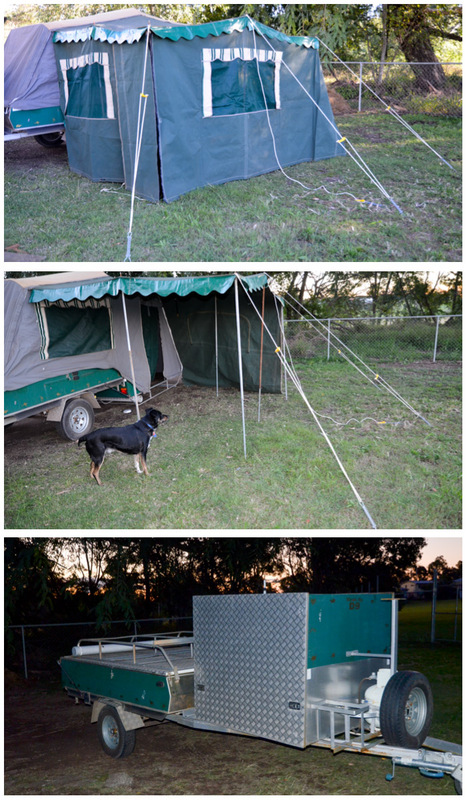 Neither of us were actually looking for a camper trailer - but that's what we bought this morning! In 2008 we hired a soft-floor camper trailer and decided against that style of camping. In more recent times we have viewed a number of hard-floor campers at different camping expos. These models seemed far easier to set up and we considered one as a possible option for sometime in the future. Our new acquisition was advertised as a home-made Aussie Swag camper. It's previous owner ("D9") had made several modifications, the most obvious one being a large storage box on the draw bar. We have a few ideas for how that may work better for us - and yes, I'm still scheming for an on-board kitchen of some sort! For the moment we've tested that our camping chairs and bi-fold tables fit nicely. Of course, we'll look at what else can be stashed up front as well as how best to set up generally. The camper trailer's previous owner spent a fair bit of time at Thargomindah, which seemed a good sign (or sticker) to us! While living in the van, we bought a new double-bed mattress. It might fit the bed platform of the camper trailer, which would be great! Fingers crossed for that easy improvement. For quick overnight stops, we think two stretchers could be set up on the hard floor area adjacent the bed. When staying longer, we can set up the awning/annexe and maybe one of our tents. Backyard practice might be in order! The camper came with a heavy-duty gas burner and a camp kitchen table/pantry unit. We'll sell those as we prefer our dual-fuel stoves and bi-fold/3-height tables. The van is also being prepared for sale - to offset the camper trailer cost. Wish us luck for super-successful wheeling and dealing! We haven't yet had a cake to celebrate our new camper trailer but we did enjoy a roast chicken dinner! Winner Winner chicken dinner is spot on! Congrats on a great buy! 30 Seconds - or so!